Get ready to shop the handmade creations of more than 800 artisans from Nov 28 to Dec 8. 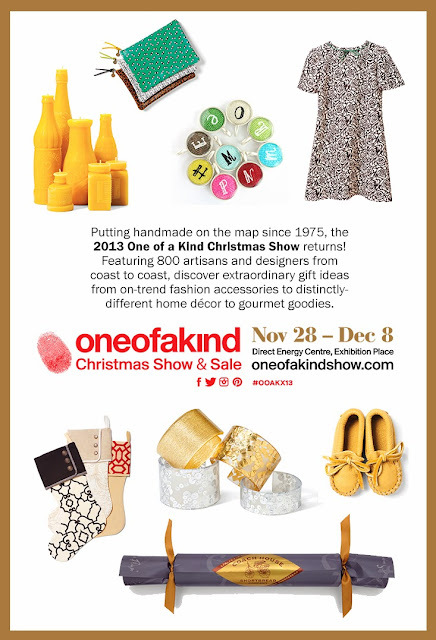 The One Of A Kind Show is the largest consumer craft show in North America and we have 10 pairs of tickets to giveaway! Just Tweet @hipurbangirl and @ooak_toronto and tell us what you love about the OOAKS. This contest closes Wednesday, November 20, 2013 at 11pm EST. For more information, visit www.oneofakindshow.com and follow the Twitter conversation with hashtag #ooakx13. I love going to OOAK every year with my dear friend, Alana. It's our Christmas present to each other! I love to eat Coach cookies. pick meeeee. its my favourite show! i love meeting the artisans and of course, buying their products!